PelGar’s Deet 34% personal insect repellent cream is made to our own specially designed formulation and incorporates Deet and pyrethrins as the active repellence ingredients, synergised with piperonyl butoxide (PBO). The special formula has triple protection from all biting insects which inhibits the insect’s biting mechanism, repels insects away from you and kills the insects when they come into contact with the cream. 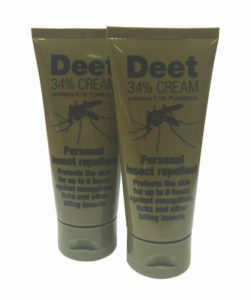 Deet 34% cream is a highly concentrated insect repellent that will give a rapid knockdown and kill of mosquitoes, midges flies and other biting insects and is ideal for use any time during deployment or training. The versatile pack is compact and fits into battle dress/combat fatigues, uniforms, battle rig pouches or pockets. Deet 34% Personal Insect Repellent Cream will repel insects such as mosquitoes, midges (including the Scottish midge), sandflies, horseflies, cleggs, ticks, wasps, hornets, moths, houseflies, cluster flies, fruit flies, fleas, bedbugs and ants. DEET (diethyltoluamide) has long been considered the most effective mosquito repellent. It was originally developed in the USA for military use and is formulated such that mosquito’s receptors are blocked form sensing human sweat, odours or CO2 emissions that attract mosquitoes.